Oxfam says while Bill Gates exemplifies how outsized wealth can be recycled to help the poor, "big philanthropy" does not address the fundamental problem. Just eight individuals, all men, own as much wealth as the poorest half of the world's population. This is according to a report from Oxfam, which calls for action to curtail rewards for those at the top. Four out of the eight individuals named in the report are tech leaders, including the world's richest man Bill Gates, Amazon boss Jeff Bezos, Facebook's Mark Zuckerberg and Oracle's Larry Ellison. Oxfam bases its calculations on data from Swiss bank Credit Suisse and Forbes. The other four named in the report are Inditex founder Amancio Ortega, veteran investor Warren Buffett, Mexican billionaire Carlos Slim and former New York City mayor and Bloomberg founder Michael Bloomberg. As decision-makers and many of the super-rich gather for this week's World Economic Forum (WEF) annual meeting in Davos, Switzerland, the charity's report suggests the wealth gap is wider than ever, with new data for China and India indicating the poorest half of the world owns less than previously estimated. Oxfam, which described the gap as "obscene", said if the new data had been available before, it would have shown that in 2016, nine people owned the same as the 3.6 billion who make up the poorest half of humanity, rather than 62 estimated at the time. In 2010, by comparison, it took the combined assets of the 43 richest people to equal the wealth of the poorest 50%, according to the latest calculations. "We see a lot of hand-wringing - and clearly [US president-elect Donald] Trump's victory and Brexit gives that new impetus this year - but there is a lack of concrete alternatives to business as usual," said Max Lawson, Oxfam's head of policy. While many workers struggle with stagnating incomes, the wealth of the super-rich has increased by an average of 11% a year since 2009. 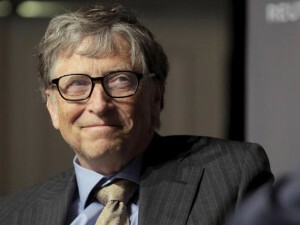 Gates, the world's richest man who is a regular at Davos, has seen his fortune rise by 50% or $25 billion since announcing plans to leave Microsoft in 2006, despite his efforts to give much of it away.